These are the top five questions that have cropped up repeatedly in the feedback survey. I am sure other people have wondered these things too so wanted to shed some light on these topics. Please know that myself and the rest of the production team work really hard to create the space for an amazing event. Sometimes, our hands are tied. Sometimes, at a new venue, we learn things from experience. We ask for your feedback so that we can strive to do better next time. I hope that you all had a fantastic time in spite of the hiccups. P.S. Photo is lost and flailed. Let me know if anything is yours. P.P.S If you have feedback, please fill out this form. We are listening. 1.WHY DID IT HAVE TO END AT 2AM? End times depend on a lot of things, mostly on the venue owner’s permission and City of Vancouver event permits. For this year, the venue is privately owned and they have an event and liquor license from the City of Vancouver and BC Liquor. These dictate that they can only have events go until 2am. Guess what? City noise by-laws kicked in for the outdoor space. They don’t usually let anything happen outside past 11pm on a weekend night. CoV permitted our outdoor space until 2am! That was a huge win for our event. I personally spent about 30 hours total on getting all of the permits from the City of Vancouver for our event. I advocated as hard as I could for our ticket capacity, outdoor space, art installations, fire performance and fire art. 2. WHY WEREN’T WE STAFFING THE BAR AND COAT CHECK? It is a really big challenge to find a venue that will allow us burners to do what we do: to have indoor and outdoor space, as well as, fire performances and art. It is actually a challenge to find venues in the greater Vancouver area for events larger than 500 people, period. Finding a spot to have Dustcovery right downtown meant that we had to make some compromises. This venue was willing to work with us and all of the quirky things we like to do. Normally, they don’t allow event organizers to scan tickets at the door or to bring in their own sound stage equipment. They did work with us to make these happen. If you know of venues where we could hold our event. Please let me or any of the members of the GVIAS board know! We welcome all suggestions. 3. WHY DO WE HAVE TO LEAVE RIGHT AWAY WHEN THE EVENT ENDS? I know, I know. People want to bask in the afterglow of the event. We have to pay for staffing and security. They want to go home when their shift is supposed to end. We also don’t want to pay them overtime! One of the other big reasons we appreciate you gathering your things and leaving the venue relatively quickly is that our production team and Rangers are ALL volunteers. My associate producers and I started our day at 9am and finished up after 3am. We were sober and working that entire time! We really just want to take our freaking boots off and fall into bed before having to be back on site at 9am for tear down. 4. WHAT WAS UP WITH THE BATHROOM SITUATION? I acknowledge it was an issue. I asked in the survey how long bathroom wait times were. With 93 responses right now, the average wait time was 10 minutes. During the peak time (10:30pm – 12:30pm) the wait times were up to 30+ minutes. I apologize for this and any inconvenience it caused. I did ask the venue about bathroom numbers and they assured me that they have had more people in the building on the bottom floor and it’s been enough. People also asked why we couldn’t open up the bathrooms on the second floor. I met with security and the venue manager at around 11:30pm about this. Because we didn’t rent the entire space upstairs, there wasn’t enough existing staff to monitor all of the different pathways to the upstairs bathrooms and keep everything secure. Trust me, we tried to think of a way. Wherever Dustcovery is next year, the production team will ensure there is a block of portos outside, just in case! 5. WHY WASN’T THERE INFORMATION ABOUT PARKING OR HOW TO GET THERE OR …? We emailed a survival guide with all of this information to every ticket buyer the day before the event. We also posted this information on the Dustcovery website, in blog posts and on the Facebook event page multiple times over the past few weeks. Radical self reliance means reading up on what you need to know in order to get yourself to the venue and how to conduct yourself. This entry was posted in News on November 20, 2018 by squishelle. SURVIVAL GUIDE & WAIVER was just emailed to all ticket buyers. If you purchased more than one ticket under your Eventbrite Account, or if you sold your ticket to someone else, it is your responsibility to forward this message to each ticket holder under your purchase. Thank you! If you did not receive an email, first please check your spam folder! Then email me at dustcovery-comms@gvias.org & I can resend. This entry was posted in 2018, News on November 16, 2018 by squishelle. Newbie Welcome Reception @ 9:15pm / Pick Your Brain Scavenger Hunt! Howdy from your Dustcovery 2018 Newbie Welcome Team! Everybody’s invited to join us at 9:15pm for the Newbie Welcome Reception at Playa Info (on the right just after you enter Doors) for a giant rainbow welcome to Dustcovery 2018!! After the Newbie Welcome, you’ll have just enough time to grab a drink, or make a quick round of the venue before heading outside to catch the fire show at 10:15pm! For the rest of the evening, we hope you’ll join in on a GIANT Scavenger Hunt that will help you meet some amazing Burners! Newbies, recent arrivals and long-time Burners are all encouraged to stick their heads together and discover hidden gems in this community of ours! Come say hello to our amazing volunteers at Playa Info anytime during the evening for a yak, a Scavenger Hunt card and a good time! Can’t wait to see you all on Saturday! ! Joss & The Newbie Welcome Team! Still looking for volunteer hours? Come volunteer with us for a 90 minute shift of high-energy Immediacy and Radical Inclusion! Apply through Volcor and make sure to click Newbie Hub in your application! Alternately, send me an email at joss_klinck@hotmail.com if you need assistance! This entry was posted in 2018, News on November 15, 2018 by squishelle. Dustcovery is coming up soon!!! Need a few more volunteer hours and can think on your feet? 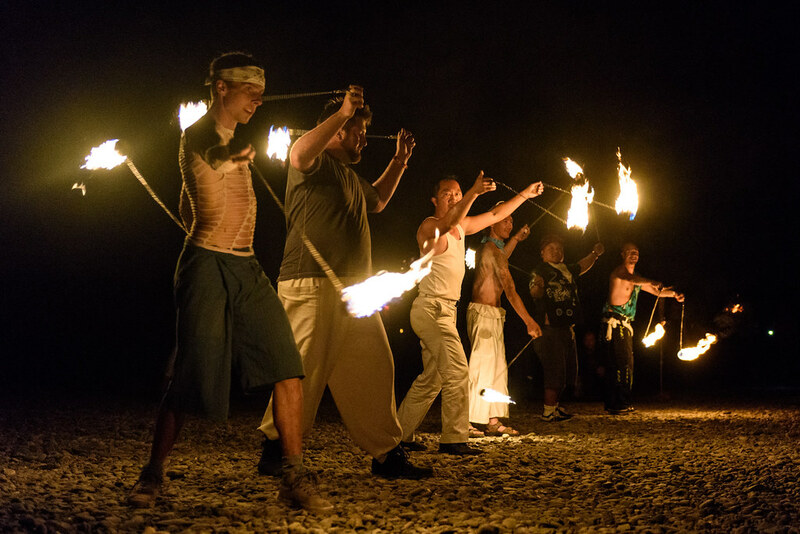 If you want to help keep the fire performers safe, we can totally use you! 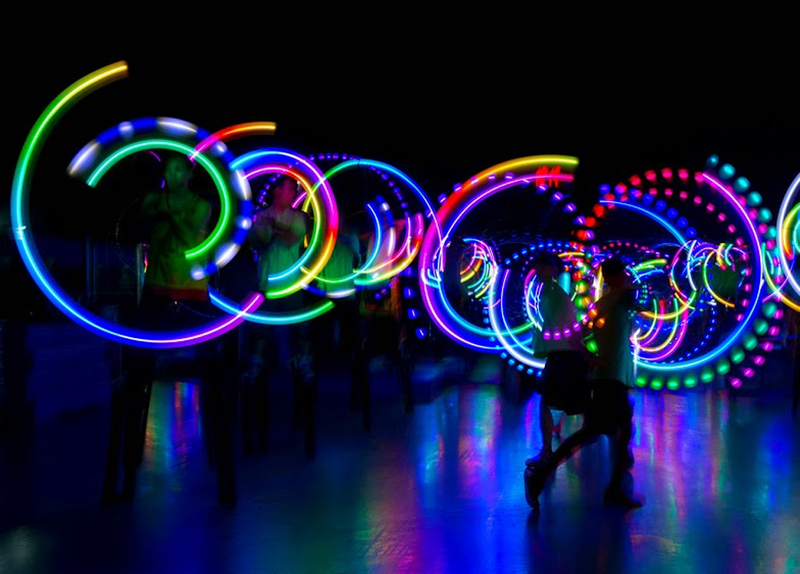 We want YOU on stage with your LED hoops, poi, fans or que sais-je ! We also want you if you only have your bum to shake ! Shift are 30 min on the main stage from 11pm to 1am. Bring your sparkliest outfit, lift the energy of the room up to the roof ! Note: must already have a ticket! This entry was posted in 2018, News on November 14, 2018 by squishelle. Our producers were able secure 140 parking spaces for the event. They will be available during the day for set-up crew, artists, BC Rangers and volunteers and will continue to be free during the event and until teardown the next day (Time TBD). THESE SPOTS ARE FIRST COME FIRST SERVE! Given the limited number, please do not rely on free parking being available; if you are not part of the set-up crew or early volunteer shifts, there is a good chance they will be gone. You will find these spaces marked off on the South side of Pacific Blvd just as you are approaching BC Place – See photo for a closer look. Don’t worry: LOOK AT ALL THE PARKING NEARBY! 1. There is an Impark underground parking just past our free parking lot. This location also boasts 6 Modo and 6 Evo parking spaces if you choose to ride share. 2. The next closest parking is a huge pay lot slightly further down Pacific Blvd. Stadium Skytrain is about 5 minutes walking distance. For anyone coming from out of town requiring RV parking, the best location that’s nearby to the venue will be by the Home Depot on Terminal Ave & Glen Dr (see map link for reference). It’s still a fair distance from the venue so be prepared to taxi, bus or walk. Whatever you do, however you get there, be safe and be sober! This entry was posted in 2018, News and tagged parking on November 14, 2018 by squishelle. Guess what? 4 more sleeps AND we are completely sold out! We will be switching to having all posts approved. Please take a look at the pinned post on this event page and the Dustcovery website & blog for ALL of the information you need to know. This entry was posted in 2018, News on November 13, 2018 by squishelle. Come to the Ravebots! Stage on the mezzanine to get your mechanized groove on. This entry was posted in News on November 13, 2018 by squishelle. You can sell your ticket privately to anyone you want. Only buy/sell from trusted people at face value! There are no names attached to individual tickets, so treat each ticket like a physical ticket. In order to try to help ticket seekers find available tickets within the community, we’ve created a self serve list. The hope is that once someone finds themselves with an extra ticket to sell, they will look on the sheet to contact folks directly, and more easily. Good luck! This entry was posted in 2018, News on November 12, 2018 by squishelle. Here’s a list of all of the phenomenal theme camps & art projects being shared at Dustcovery. Remember, doors open at 8pm, and event ends at 2am. COME EARLY to experience all the goodness! ALL OF THIS is gifted to the community by YOU, the participants. Do not simply go forth blindly and consume, but instead participate! Look for ways that you can help support these creators and artists, whether helping with set up & teardown, or volunteering with the event production. To be a part of the creation of this event, check out the Volunteer page to sign up. Massive props to the Art Placement team, Kristen & Kyle, for their heroic efforts & great sense of space in placing all of these projects on site! See list on the Art & Theme Camps page.